Thanks for sharing HRuday with me. Please accept my congratulations and share it with all your team members who did a splendid job. I immensely thank the editorial board for their taking pain in editing elegantly. I'm sure days ahead' HRuday' will be a popular professional news letter and would bind the HR professionals firmly. Liked the interpretation of' HRuday'.Most importantly all smiling faces bring colours to this edition.I personally thank all the contributors for sparing their valuable time for this cause. Gone through your newsletter “ HRuday”. Its really interesting and packed with HR related message for Gen Ys. Head – HRMC, Corporate Centre, L&T Construction,Chennai. Great initiative. HRuday buzz will keep the ball rolling. Congratulations to your editorial team and the young contributors. Human Resources, Smartlink Network Systems Ltd.
Congratulations for the first issue of HRuday. The team has done a Fantastic Job. It is a well drafted e-newsletter. Best wishes for Next Issues. You have done an excellent job. Keep the articles crisp and short. In each edition, you may focus on one HR topic as special feature and of interest for HR professionals. Sr. Manager, Nestle India Limited, Ponda, Goa. It gives me immense pleasure to congratulate you and all others indirectly involved in bringing out such a valuable newsletter of Goa area. Congrats for the initiative. I was going through the contents and sure, the direction in providing platform for HR is clearly visible. You can focus on giving the information of Best HR practices at Goa Organization, and what can be learnt from those best practices. In case, your HR forum wish to have a study on Best HR practices at Goa study, we will be glad to be part of such study. Fantastic efforts… seen through all the pages!! Great initative... too good on your first attempt in creating this. Keep it going !! Best wishes to the HRuday team !! I happened to receive your inaugural issue. It was very exciting and nice to see a Goa HR Forum. The name HRuday is been very intelligently explained by Dr. Rao, great all the best and keep going. Really excellent job - lovely layout, good articles and above all, a fantastic and apt name. Keep up the good work. Hearty Congratulations !! Hearty congratulations on your first Newsletter and hats off to this refreshing initiative. Terrific work on the inaugural newsletter. Great initiative to get HRs connected.Congrats and best wishes. Thanks for the September issue of the newsletter. Would love to read about some distinctive HR practices followed by the local companies in Goa. I believe that small and medium Indian companies demonstrate a great deal of heterogeneity in HR practices. I hope you will highlight such interesting aspects in your future newsletter. All the very best for a long innings. Great Efforts by the Team. It's come out very well. Pramod V. Sulakhe, HR, Nebula Home Products Pvt. Ltd.
Manoj KHARDE Human Resources Sanofi-Synthelabo (India) Pvt. Ltd.
Congratulations for the great work. This is really a very good initiative. Keep up the same zeal & spirit! Rakhee Sharma, Nestlé India Ltd.
Congratulations for the inaugural issue HRuday. 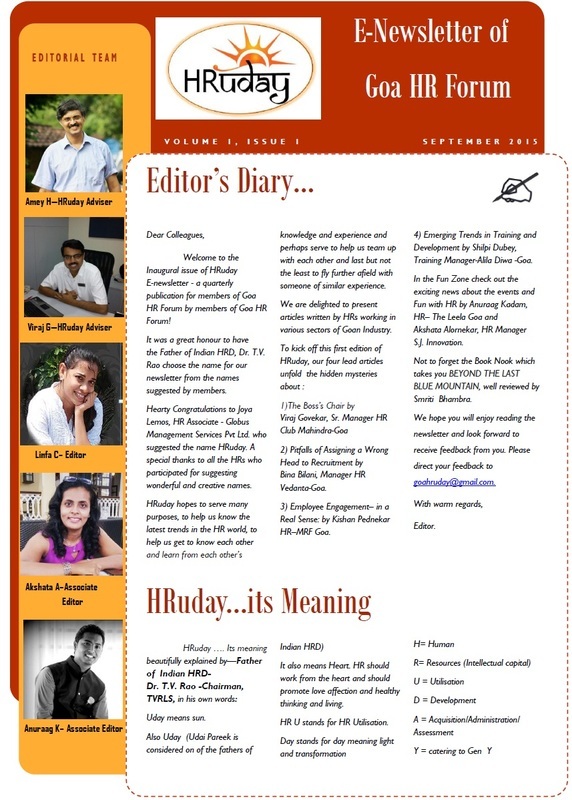 Hope, this e-journal would be quite handy for the young HR professionals of Goa. Goa, a small but most happening place with lot of industries coming there. Kudos for your untiring efforts to bring out a journal. Keep it up ! 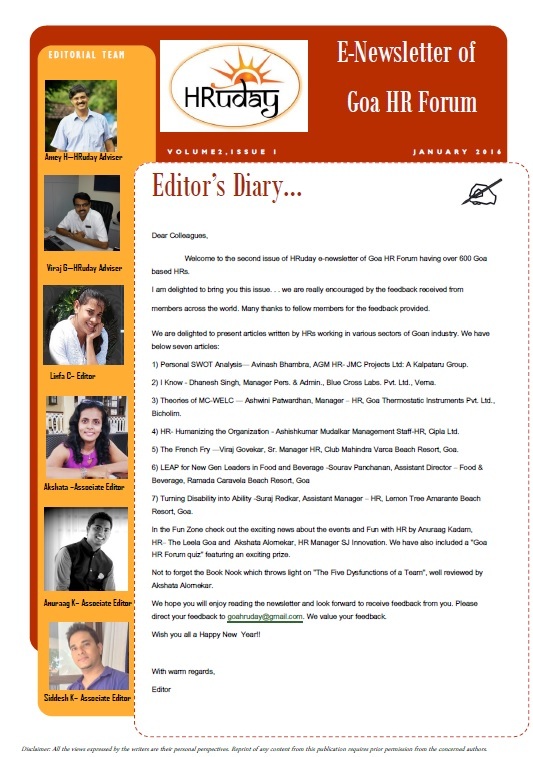 I have gone through HRuday e–newsletter of Goa HR forum. Hearty congratulation to you and your team for this great innovation It is wonderful and heart touchy. Congrats !! & best wishes to the entire team of HRuday. Keep up the gr8 work .